Home Technology News Automotive Do electric supercars have a future? There has been a bumper crop of electric supercar announcements this week, which gives an opportunity to consider the role this breed of supercar is playing. 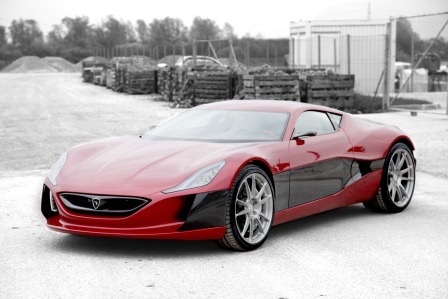 Croatian firm Rimac announced that its Concept_One supercar is now available to order. It has a top speed limited to 300km/h, and does 0-100km/h in 2.8 seconds. Rimac claims a range of 600km on a single charge. Work is also progressing on the Audi e-tron, with a fleet of test cars ready to be sent out. The car will be powered by a 312bhp electric motor and accelerate to 0-100km/h in 4.8 seconds, Auto Express reports. In addition, although not strictly a pure electric vehicle, speculation is mounting that the next Ferrari supercar will be a petrol / electric hybrid. The car will also feature a Kinetic Energy Recovery System of the type pioneered in F1 to recover energy from braking. Electric supercars are appealing to engineers because of the opportunities an electric powertrain gives to boost performance. The strongest criticism of them is that their limited range makes them impractical. The Rimac Concept_One is probably unable to sustain its top speed for very long. They also sell in such small numbers, it can be alleged that they are insignificant environmentally and merely an opportunity for companies to flex their engineering muscles. As the Concept_One proves, and as demand for the Tesla electric supercar has shown, the demand exists. The technical advancements made in their development – improving the efficiency and effectiveness of electric motors and batteries for example, are valuable if they trickle down to the mainstream. Also in the past, most electric cars have suffered from looking simultaneously peculiar and dowdy. Supercars are not peculiar and dowdy, they look cool. At the very least, these vehicles will help electric cars enter the mainstream as objects of desire for speed freaks.